This week I've been digging through old issues of the Kentucky Gazette, the first newspaper published in Lexington, Kentucky. The issues from 1813 offer an interesting look into life on the home front during the war for the northwest. The newspaper has been archived and is available to peruse at the Kentucky Digital Library. 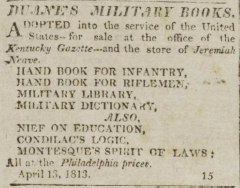 Newspaper publisher, Irish republican, and sometime Colonel of the Rifle Regiment William Duane won War Department recognition of his manuals for infantry and riflemen in 1813, and booksellers were quick to offer his books to Army officers. 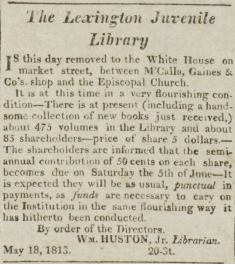 The Juvenile Library offered members a collection of 475 volumes, for a fee of 5 dollars up front and dues of 50 cents a year. 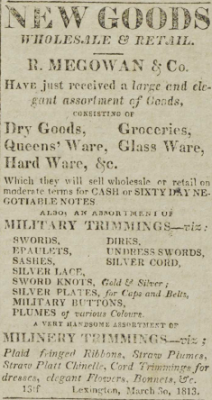 R Megowan & Co offered swords, epaulets, buttons and plumes for officers, who were expected to purchase their own uniforms. 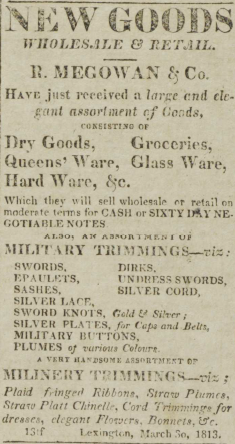 They also sold trimmings for ladies' hats. Instructors were available for lessons on the use of the broadsword, as well as dancing, manner, and deportment. 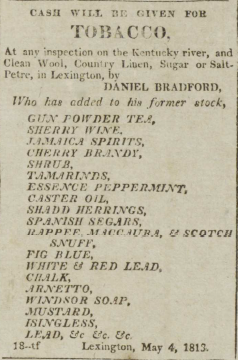 Daniel Bradford advertised to purchase raw materials such as tobacco, wool, linen, sugar and saltpeter and in turn offered lots of imported goods, such as tea, sherry, rum, cigars, snuff, and mustard.